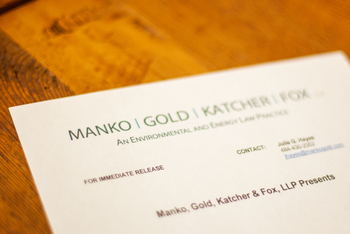 Voorhees, NJ (March 3, 2011) – The environmental and energy law firm of Manko, Gold, Katcher & Fox, LLP (MGKF), will serve as co-sponsor of the Chamber of Commerce Southern New Jersey's (CCSNJ) March 30, 2011 "Meet the Policymakers" program, featuring Bob Martin, Commissioner of the New Jersey Department of Environmental Protection (NJDEP). Commissioner Martin will share the latest developments in environmental policy relative to the business community. An accomplished business and industry leader with recognized expertise in energy and utilities, Commissioner Martin served as a key policy adviser throughout Governor Christie's gubernatorial campaign. He assisted in shaping and then drafting then-candidate Christie's Energy Policy and Environmental Policy, and provided policy guidance on other major issues. In recent years, he also has served as a respected and trusted adviser, primarily in energy policy, to several candidates for U.S. Senate, congressional and gubernatorial seats.